On Saturday, November 6, 2010, we'll be holding our fourth annual Fairfield / Westchester Code Camp! As in the past, this event will be held at the University of Connecticut, Stamford Campus. This year, we'll have 36 sessions (75 minutes each) across 6 tracks, given by some of the best regional and local developers, and will have topics such as WP7, Silverlight, Entity Framework, PowerShell, F#, MVC, NoSQL, SharePoint, and so much more! As usual, we will have giveaways, food, and coffee. Seating is limited and our focus is technology. No recruiters, please. I’m over in Zeist, the Netherlands speaking at the Software Developers Conference, put on by the Software Developer Network of the Netherlands. Back when this event was called CTTP, it was my first international speaking event in 1998. I’ve been speaking at this conference every year since 1998, only missing the event in 2000. I have spoken at three other events produced by SDN over the years besides the SDN/CTTP, so this is my 15th, yes 15th time speaking at this organization’s event in the Netherlands. I have no idea why they keep inviting, me, I usually show up to sessions with beer, go to the red light district instead of my talks, or make fun of Dutch people the entire time I am here. This year I am speaking on RIA Services and doing an Q&A on Scrum and Agile. Hope to see lots of Dutch there! The OData talk did more of the same, same as my TechEd talk, so you can download the slides and demos here. I also recorded an episode of .NET Rocks with Richard and Carl. Tomorrow is a Scrum talk with Joel. You must register at https://www.clicktoattend.com/invitation.aspx?code=150256 in order to be admitted to the building and attend. They say that Windows Phone 7 can't multitask. They're wrong. Join Charles Petzold for a programmer's perspective on the multitasking features of Windows Phone 7, including tombstoning, asynchronous operations, and push notifications. Charles Petzold is a New York City based freelance writer who has been writing about Microsoft operating systems since 1984. His latest book, "Programming Windows Phone 7," will be available as a free download in October. Startups usually like to go with Open Source Software (OSS) for the obvious reasons, start ups are low on funds and OSS is free. Microsoft has a program for startups that will give the startup a copy of all of its software for use in production for free until the startup reaches a certain point of growth (usually $1m in revenues) or gets acquired by a larger entity. This program is called BizSpark and it has been around for a little while. Approximately 30,000 startups have taken advantage of BizSpark so far. I am the co-founder and investor of a startup called Triton Works. (Picture Expedia.com for Ocean Freight.) Myself and three partners founded it in 2008 and Triton was one of the first companies to accept BizSpark “funding.” Today I am happy to announce that Triton was acquired by UBM. Triton has graduated from the BizSpark program! Hopefully success stories like this will build awareness to the BizSpark program. We’re agile, so we don’t have to estimate and have no deadlines, right? Wrong! This session will review the problem with estimations in projects today and then give an overview of the concept of agile estimation and the notion of re-estimation. We’ll learn about user stories, story points, team velocity, and how to apply them all to estimation and iterative re-estimation. We will take a look at the cone of uncertainty and how to use it to your advantage. We’ll then take a look at the tools we will use for Agile Estimation, including planning poker, Visual Studio TFS and much more. Having challenges implementing Scrum in your organization? Have you been using Scrum but need to bend the rules to make it work in your organization? Do you practice a little Scrum with a mix of Kanban? Then this session if for you! Come and learn about implementing Scrum, but with a few changes. We'll look at customizing Scrum in your environment and look specifically at how to implement Scrum for the enterprise, ISVs, consulting and remote teams. Microsoft is launching Windows Phone 7 today and I fear it may be too late. I, like many Microsoft watchers, was an early adopter of Windows Mobile. I used my Windows Mobile 6.x phone until it broke, and even then, I put tape over it and got another 6 months out of it. I held out until I arrived in Hong Kong last summer to buy a new phone, a HTC Magic running Android 1.7. I liked it so much, I was one of the first people in Hong Kong to buy a Nexus One back in January-this after I had one of the first sneak peeks at WP7 on Microsoft’s campus in January. As I used my “Google Phone” as I call it, I soon became dependent on Gmail for my main email communication, and other Google applications for my other daily chores. I use to use hosted Exchange and POP with Outlook and Outlook Web Access, now I am 100% Gmail, I don’t even have Outlook installed on my machine. I frequently show a Hong Kong taxi driver where I am going on Google Maps and use Layer (and a little Foursquare) to find new places to eat and such in Hong Kong all the time. I use the camera on the phone so much that I don’t even carry my point and click anymore. I sit at Starbucks and use the WiFi hotspot from Android 2.2 to work all day. The list goes on. Google lured me in with a new phone and then before I knew it, I was deep inside the Googleplex and outside of the Microsoftplex. Today, Windows Phone 7 ships. The problem with Windows Phone 7 is that it is one year too late. Last summer all the people like me with a Windows Mobile 6 phone had a new contact, or broken phone and went with an iPhone or Android. Those customers may never come back. I may not. 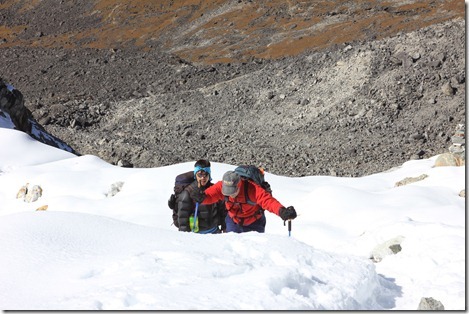 Last week I wrapped up a successful high altitude trek and climb in Nepal. I did this to help raise money for Education Elevated, a charity that is building a school and library in rural Nepal. As always the kids are super cute. After the schools, it was time to gain altitude. 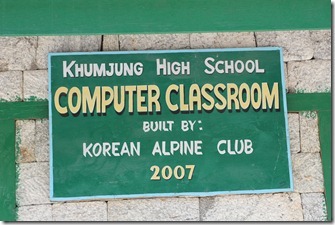 (Ok both schools are over 3000m/10000’.) 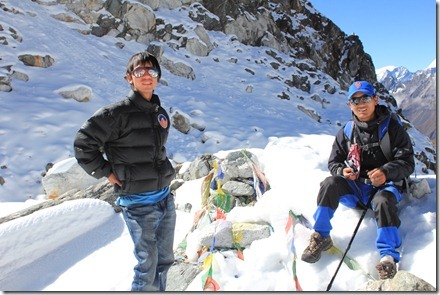 After we visited the Hillary School in Khumjung, we started to gain altitude and the scenery was stunning. 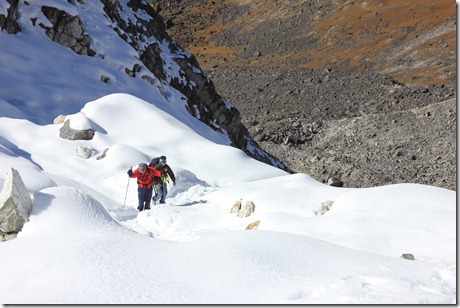 We climbed the Gokyo Valley side, not the Everest side that I did in 2008. 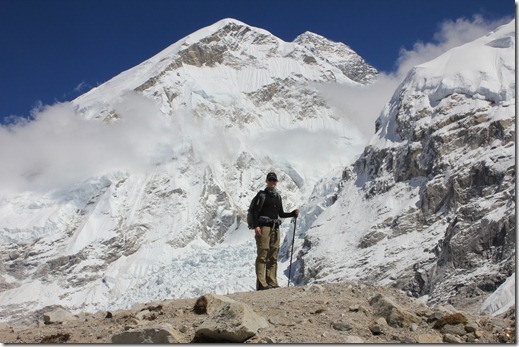 Even our sherpa’s geeked out and took tons of photos. 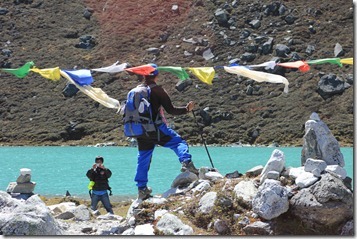 After three days we reached the town of Gokyo (15,000’), right on the third glacial lake. 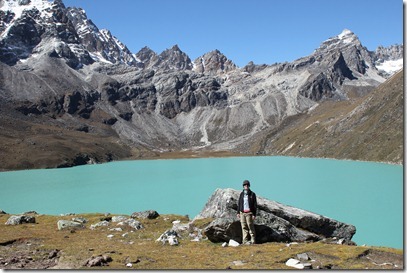 The next morning we climbed Gokyo Ri (5400m/17500’) and the views were amazing, the best I have ever had in Nepal. 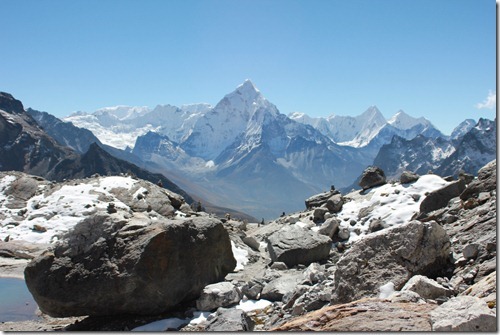 If you are planning a trip to Nepal, make Gokyo your base and Everest Base Camp your secondary target. The cool thing about being on top of Gokyo Ri is that you have a 360 paranoiac view of the Everest portion of the Himalayan Range. Here is a video I shot trying to show it off. 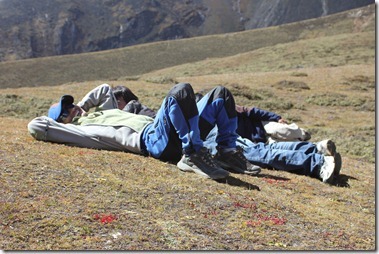 After a short rest, we trekked to a village below the Cho la pass (5400m/17500’). The pass was very, very hard, straight up in the snow for over an hour, a lot of the time you are on your hands and knees. 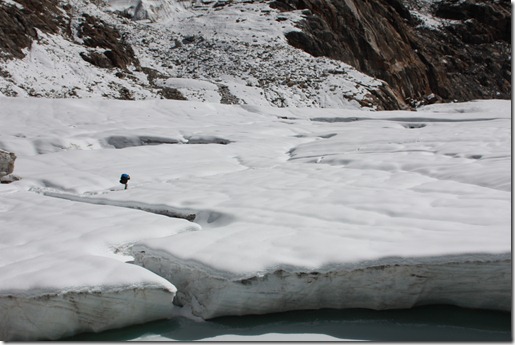 After a few hours in the snowfield, we finally reached our destination. After about 7 hours of climbing and trekking, it was about 1pm (we started super early to avoid the wind and sun making the crevasses unstable.) After lunch, we pushed on 3 more hours to Loboche village at about 5000m/16000’. 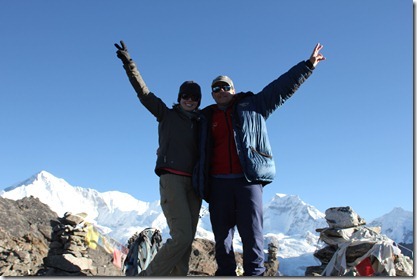 The next day we pushed on to Everest Base Camp and then headed down the mountain. 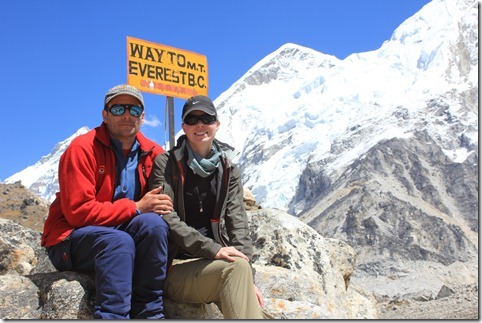 A few days later we were back in Kathmandu dreaming about our next Nepalese trek!